Lucknow, April 09, 2018: Vodafone, one of India’s largest telecommunication services providers, today announced the roll-out of its Voice over LTE (VoLTE) services in cities like Lucknow, Kanpur, Varanasi, Gorakhpur, Allahabad, Faizabad, and around 26000 towns and villages in the circle. Vodafone now enables its customers to make calls using VoLTE and enjoy HD quality crystal clear voice with super call connect. Vodafone SuperNetTM4Gcustomers can access Vodafone VoLTE for no additional charges and all calls will be billed as per existing plan or pack benefits, thus experiencing the best from Vodafone’s Data Strong Network. 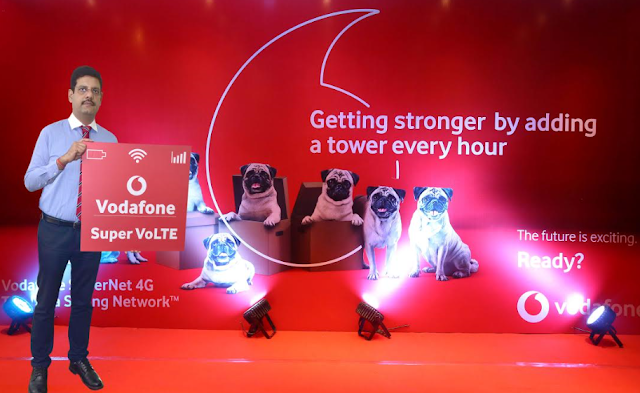 Vodafone VoLTE service were recently launched in Maharashtra and Goa,Mumbai, Delhi-NCR, Gujarat, Rajasthan, Haryana, Karnataka , UP west and will be extended across the country in a phased manner over the next few months. 3. Ensure the device has a Vodafone 4G SIM: Customers with Dual-SIM handsets have to ensure that the Vodafone 4G SIM has been inserted in the data SIM slot/slot 1 and network mode has been set as “4G/3G/2G (Auto)”. Vodafone VoLTE will be available on all VoLTE devices. Currently following popular VoLTE handsets are compatible with Vodafone VoLTE and this handset universe is increasing rapidly to include all popular models. Vodafone India is a 100% fully owned subsidiary of the Vodafone Group Plc. with operations across the country serving over 211 million customers (over 114 million in rural areas). Commencing operations in 2007, Vodafone is today India’s largest foreign direct investor, with a robust, award-winning business and committed for the long term. Vodafone Business Services serves the needs of enterprises and government by providing total telecommunications (Voice and Data) solutions across mobility and wireline platforms. Our mobile wallet, M-Pesa is a unique and innovative money transfer service from Vodafone that fosters financial inclusion.